Grabbed another baseball photo from the Leslie Jones collection to look at, in part because it's the first action shot I've seen of catcher (and sometimes government agent) Moe Berg behind the plate. The August 4, 1937 date attributed to this photo would be game one of Boston's doubleheader against Cleveland, since Berg didn't play in the nightcap. 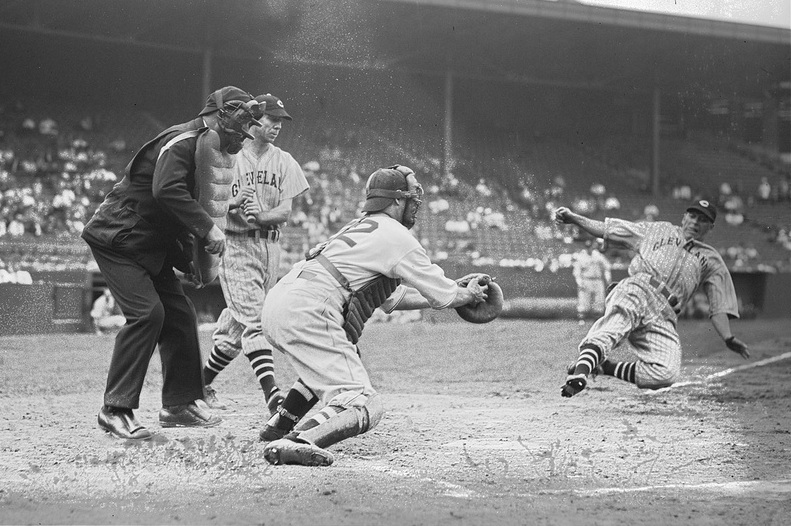 The library's original photo summary names the home plate umpire but leaves both Indians unidentified. 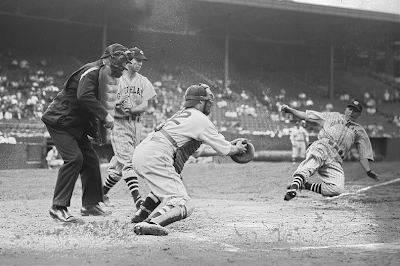 Boston Red Sox catcher Moe Berg (#22) attempts to tag unknown Cleveland Indians base runner at home plate during the August 4, 1937 game at Fenway Park. Home plate umpire is Bill McGowan. This photo shows the unusual situation of a hitter watching, bat in hand, as a teammate tries to score from third. A Flickr commenter proposed this is a straight steal of home by shortstop Lyn Lary, who scored twice during the August 4 game, once after doubling and again after a walk. The box score does credit Lary with a steal (base not specified) and only one hitter following him in the lineup has an RBI, so I follow that rationale. There's no play-by-play for the August 4, 1937 game at Retrosheet.org, so I checked Google News Archives hoping for original coverage. Several papers from August 5 picked up an AP story about Tom Yawkey's $3 million lineup investment and their winning streak, but said little about the game, so didn't help pick out the play itself. My alternate theory: the runner is actually Cleveland catcher Frankie Pytlak (note the angular face), who was no slouch on the base paths and would have more reason to run for home with the bottom of the order behind him than leadoff hitter Lyn Lary. According to June 18's box score, Pytlak reached based twice, scoring once in the second inning. This time, there's original newspaper coverage. It doesn't say what the "error by Berg" is here, but fumbling the ball away and allowing a runner from third to score can be an error instead of passed ball. That might make our batter starting pitcher Johnny Allen, who finished an amazing 15-1 for Cleveland that year, but was pulled mid-game and didn't figure into the final decision. (Don't feel bad for Moe himself, who knocked in 3 runs, keying a 5-4 comeback win.) The home plate umpire would be George Moriarty. Does anyone but me like that alternate theory better? FRIDAY UPDATE: Players and game identified! 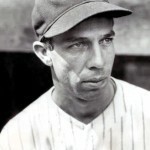 I found this comparison for Cleveland pitcher Johnny Allen (posing with Bob Feller and Mel Harder), which made it clear Leslie's original photo wasn't Allen batting, so I'm only half-right. My game date of June 18 is wrong, but I'm correct that it's Frankie Pytlak sliding. The batter is our aforementioned Lyn Lary, shown in close profile below. Short story, the pictured players are Frankie Pytlak sliding, Lyn Lary batting, and Bill McGowan as home plate umpire. 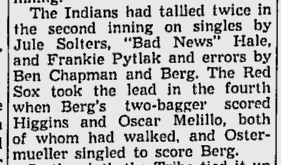 Hard to pick out the exact circumstances with just a box score, but Boston made two infield errors that game, so perhaps Frankie ran home after SS Joe Cronin or 2B Eric McNair muffed a pick-off attempt and threw home too late to catch him. Thanks for following along with the photo research--back to type cards next week!